Where great chefs go to eat and gain inspiration . . .
For the country's leading chefs, experiencing restaurants fully from the diner's side of the table is crucial to their creative and professional development. Andrew Dornenburg and Karen Page present the wisdom of the nation's top chefs about their favorite places to eat across America. 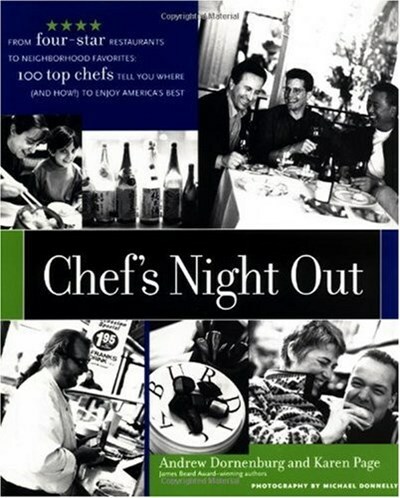 With opinions about four-star restaurants as well as favorite neighborhood haunts, 100 of America's top chefs-including Rick Bayless (Frontera Grill, Chicago), Daniel Boulud (Restaurant Daniel, New York), Susan Feniger and Mary Sue Milliken (Border Grill and Ciudad, Los Angeles), and Lydia Shire (Biba and Pignoli, Boston)-share their insights about where to dine and how to maximize the dining experience in more than twenty-five of the top restaurant cities across the country. Renowned photographer Michael Donnelly captures the adventures of these leading chefs. The book includes a special section entitled "10 Steps to Educating a Palate", which will make anyone a better diner-and even a better cook-and also features sidebars which provide readers with special insights into local and ethnic cuisines, matching foods with the best wines, ordering more creatively and knowledgeably in any type of restaurant, and much more.